Among the entire Chinese population of more than 1.3 billion, only two persons succeeded in reporting bird flu cases to the authority, and both of them encountered disastrous results because of it. Qiao Song, a resident of Gaoyou in Jiangsu province, reported a bird flu case in Tianzhang city, in Anhui province in October 2005. A month later, Gaoyou police arrested him for “suspicion of cheating.” There was another case of a Hunan farmer, Peng Nengqing who suffered a great deal of hardship for reporting a bird flu case. Peng Nengqing is a disabled farmer with only a junior high school education. In the winter of 2005, he reported to the health department that his own poultry had been affected with bird flu. After examining the dead poultry, the department reported negative reaction from the H5PT-PCR bird flu test. Unable to accept the result, Peng reported it a second time, it was finally confirmed as bird flu. Immediately the State Council, the World Health Organization and right down to the municipal government were all shaken by the news. As a result he became a public enemy and was a target of bitter hatred. In March, 2006 it was nearly dark, in Laubutou village, Yongzhou city, Hunan province. Peng Nengqing, a farmer and owner of a poultry farm, dragging his crippled legs, was busy working alone cleaning up a hen house that had been burned down to prevent bird flu spreading. At that time, his wife was in the kitchen cooking dinner for the whole family. Peng picked up usable wood in the scorched piles and placed them on the burnt ground. Actually, Peng had wished to rebuild the burnt chicken farm as soon as possible. But the local government issued a notification that “breeding poultry in bird flu epidemic region is forbidden within half a year,” the whole family was thereupon “unemployed.” They could only wait for the passing of the banned period, then select chicken seedlings immediately to recover the loss as soon as possible. According to the Chinese State Council health department's notification, on November 28, 2005, it was confirmed by the national bird flu epidemic reference laboratory that Yongzhou city in Hunan province had a H5N1 highly pathogenic bird flu epidemic situation. The reason that outside regions and high government bureaus came to know of the epidemic was only because of this truthful disabled farmer Peng Nengqing who would tell the truth even at the cost of his own financial loss. Peng remembered well the disaster that happened a few months ago, but he had never regretted what he did. However, what was hard for him to believe was the fact that, before the disaster had happened, the chickens he raised were vaccinated. On September 15, 2005 poultry were injected with H5N28 bird flu vaccine from Yibang Company in Qingdao province. However on the evening of November 18, 2005, Peng found a sick chicken while inspecting his hen house and the next morning seven to eight chickens were found dead. “Everything nowadays can be counterfeit and inferior in quality, if that bird flu vaccine was effective, I would be able to escape this disaster, I lost 70 to 80,000 yuan (US$8750 to 10,000) in vain, adding to the loss of the hen house, it was nearly 100,000 yuan (US$12,500) that I lost!” Even now, Peng is still unsettled in his mind about that vaccine. After the dead chickens were found, Peng dissected one dead chicken himself. He found a hemorrhage spot on the surface of the chicken's digestive tract and heart, blood traces on the surface of respiratory tract and dropsy in the chest subcutaneous tissue. These symptoms were very similar to bird flu symptoms that he had read in books. He then called the epidemic prevention officer from the Qilidian area local office. The epidemic prevention supervision station reported the case to the Lingling district Bureau of Pasture and Fisheries. The confirmation of the epidemic experienced even more dramatic twists. On November 21, the animal disease prevention department of Lingling district, Yongzhou city sent five chicken specimens to the Hunan provincial veterinary hospital headquarters for tests, and the H5PT-PCR test result indicated negative results. The related officers told Peng the result and asked him not to make a mountain out of a molehill. But when Peng asked the officials to provide an explanation for the chicken deaths, they were unable to give him an answer. In the two days after that, Peng's poultry died with increasing speed. As of November 25, the death count ran up to 402 of which 390 were chickens, 12 were ducks. Thereupon, Peng asked the related department to investigate again, the result of the test indicated positive response this time, and it was suspected that there was an outbreak of highly pathogenic bird flu virus. Over the next few days, 6,000 chickens and ducks on Peng's farm were destroyed. On the morning of November 30, the extermination work in the bird flu epidemic area in Lingling district, Yongzhou city in Hunan province, was completed ,and a total of 108,751 domestic birds were killed, among them, 41,627 were chickens, 67,124 were ducks. Because the compensation was hardly sufficient to cover the losses, some villagers, and poultry breeding farmers, complained about this “outsider” Peng's voluntary report on the epidemic. There were even villagers who went to the local officials requesting to dissolve Peng's two year contract and to kick him out of the village, or at least not to renew his contract after the current contract was up. There were rumors that the previous low interest agriculture loans that Peng used to obtain annually would not have Peng in the quota anymore. Regarding this rumor, Peng simply dismissed it with a laugh; he thought the law would guarantee his preferential right to the contract under fair conditions. But he thought the loan was important to him because many private funding would no longer be willing to loan money to him after the disaster that happened to his poultry. Without the low interest agriculture loan, it would be an end to his livelihood. Now Mr. Peng is most concerned if the local government will pay him the compensation for the loss of burning down aviaries according to the local government's rules of eliminating bird flu thoroughly when the epidemic broke out. Originally, the main local leaders brought reporters from major media networks in various provinces and cities to capture the news of the bird flu outbreak at the time. The officers asked Peng's family to burn down aviaries to create a news effect and to show the local government's determination to prevent bird flu. On reflection, Mr. Peng realized this was revenge towards him. An insider revealed that it was impossible that the local government would compensate so much money to Peng's family. More likely they would be reluctant to pay any compensation because in their belief, Peng Nengqing was the troublemaker who created so many serious problems for the local government. 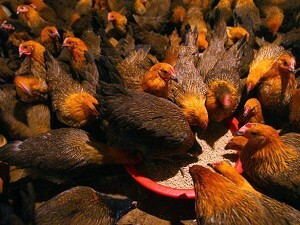 In fact, Peng Nengqing didn't embarrass the local government, when he informed the authorities of his infected poultry . What made the government more upset was that Mr. Peng talked too much to reporters . On December 1, 2005, the government in Yongzhou City announced that the epidemic was caused by a virus from migrant birds after investigations conducted by the experts from the Pasture and Veterinary Departments in the province, cities, and regional areas. However Peng Nengqing said during a telephone interview with a Beijing reporter that he thought there was only a 50% possibility the outbreak was caused by a virus from migrant birds. He suspected there was another source of disease in the village but poultry breeding farms did not report bird flu outbreaks in their farms; furthermore there were many small birds in the village and these birds spread the virus to his farm. When the Beijing reporter made Peng Nengqing's announcement known to the public, the government in Yongzhou City, Hunan Province, felt very embarrassed. Besides, the Beijing reporter in Yongzhou City also learnt that there were cases of suspected bird flu in Yongzhou City, that were not reported. Hence, the statement that the cause of the bird flu epidemic was a virus from migrant birds was immediately proven wrong. It was not surprising that some local leaders considered Peng Nengqing who dared to speak ou,t as a thorn in their side. Peng Nengqing and Qiao Songju were two peerless informants in China last year, but both have suffered for their honesty. When others saw how they were treated nobody dared to report to the authorities, and when their poultry was infected with bird flu, hurriedly sent sick poultry to the markets whilst still alive. This is the biggest hidden danger in the spread of bird flu in China.